In a time of economic downturn, the Belarusian authorities fear making any changes to the current political and economic model, which is well regarded in the state press. The Belarusian leadership has rejected market reforms and is resorting to administrative measures, increased regulation and strict discipline. Major state-sponsored organisation Belaja Ruś, dubbed a “party of the nomenclatura”, will not become a political party in the near future. Lukashenka apparently does not want another powerful political entity to emerge in Belarus. The border committee reports a twofold increase in illegal migration through the Belarus-EU border in 2015. Yet on the Ukrainian frontier it has observed no serious threats so far. All of this and more in the latest edition of State Press Digest. Belaja Ruś is not ready to become a political party. Belarus Segodnya reports on the meeting of Belaja Ruś, a government organized non-governmental organisation​ (GoNGO) dubbed a “party of the nomenclatura”. Belaja Ruś chairman Aliaksandr Radźkoŭ, speaking on the organisation's future, suggested that it could become a party as the next stage of its development. However, the logic of the whole Belarusian political system should be taken into account, and hurrying to address this question could harm the organisation. According to Belarus Segodnya, the organisation should address more acute problems, such as working with youth to prepare new leaders. Belaja Ruś was founded as a GoNGO aimed at supporting President Alexander Lukashenka, but the latter is resisting its attempts to transform into a political party. Lukashenka apparently fears that a party of bureaucracy such as this could become a strong rival in the Belarusian political arena. Special police soldiers love art and hate the opposition. Specnaz journal publishes an interview with Minsk AMAP (special police forces) commander Dzmitry Balaba. The commander tells the story of the AMAP's development since the 1990s, and its role in the elimination of crime and mobs, then widespread in Belarus. He praises Lukashenka for bringing order to the 1990s chaos. Further, he claims that Belarusian police treats offenders very humanely compared to western countries. The interview rapidly spread across independent media and became a subject of jokes. Balaba said that 70 per cent of AMAP servicemen “have higher education, know foreign languages, and among them are ardent theatregoers, historians, and lovers of 19th century academic painting”. He said he recently found two officers debating on plot lines in Bulgakov’s Master and Margarita. AMAP is known for its rude and sometimes violent treatment of citizens, especially opposition and civil activists. Brest region will apply for EU funding. Brest region is eligible for the EU-financed programme of territorial cooperation titled Belarus-Ukraine, writes Brest regional newspaper Zarya. The programme has been established in the framework of the EU's Eastern Partnership and has a budget of €3,3m. It will target cross-border projects, small and medium enterprises, tourism, sport, and the culture and environment spheres. Two regions of Belarus and five regions of Ukraine are eligible for the programme and no partner from the EU is required for its implementation. Deputy Chairman of Brest Regional Executive Committee Michail Siarkoŭ stressed that the authorities should make every effort to get hold of the funding. They already have a package of proposals in place, aimed particularly at economic development in Brest region. The government should stop reforms and manage the economy manually during the crisis. Belarus Segodnya daily reports on Lukashenka's meeting with the government to discuss economic issues. Due to decreasing oil prices Belarus is losing one of its major income sources – oil refining. Moreover, the subsequent shrinking of the Russian market makes export of Belarusian goods at the previous level impossible. In this situation, however, Lukashenka is not going to change his economic policy. He thinks that any reforms will destabilise the country and that the population will reject them. “The government should not become a kind of firm. It must govern the current difficult situation in a manual mode and demand irreproachable implementation of decisions from all levels of state officials”, Belarusian leader said. Illegal migration through Belarusian border doubled in 2015. Soyuznoe Veche newspaper interviewed Deputy Chief of the State Border Committee Ihar Butkievič on the situation on the Belarusian part of the border of Eurasian Economic Union. 8,000 people committed border offences and 900 illegal migrants to the EU were detained in 2015 – a 50 per cent increase compared to 2014. The committee detected 44 channels and detained 79 members of international gangs dealing with illegal migration – again, a twofold increase since 2014. There have been no serious incidents on the border with Ukraine, but the committee is taking additional measures to prevent penetration of weapons and extremists from Ukraine. Smuggling remains a thriving business on the border. In 2016 the Belarusian border authorities will be equipped with an electronic queue system and continue to create infrastructure for local border traffic. The problem of restitution of cultural treasures remains on the agenda. The new Code on Culture will include norms on cultural restitution, Belarus Segodnya announces. The government has created a commission to find and return national cultural treasures which were brought out of Belarus illegally, or temporarily evacuated during armed conflicts. In 2015 the authorities created online database viartannie.by which lists cultural treasures moved abroad. 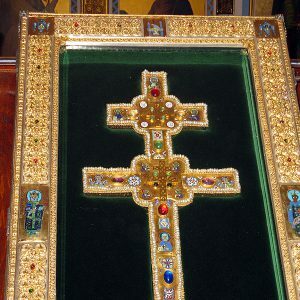 According to Ministry of Culture official Ihar Čarniaŭski, this worldwide practice shows that unfortunately countries do not return treasures to their places of origin. However, a good solution to this problem is cooperation and exchange of museum collections with other countries and long term deposit of these collections in Belarusian museums. For example, this February Belarus' national museum will host a Lithuanian-Polish exhibition of the Radziwiłł family, and Vilnius museum in 2015 displayed a belt of Great Duke Vitaŭt from Belarusian collection. On 13 January 2016, Kiryl Rudy, an economic adviser to the Belarusian president and a representative of a young cohort of a pro-reform current within the Belarusian political milieu, suggested a decrease in the duration of maternity leave. Currently Belarus allow mothers to take time off work for three years, with their workplace secured. This is the longest paid maternity leave in the post-Soviet space. Rudy argued that reducing the paid maternity leave to two years instead of three would lead to annual growth of GDP by 2.3 per cent. Considering the challenges that the Belarusian economy is facing in 2016, with falling oil prices and the ongoing recession, the state is trying to find ways to optimise the inefficient social security system as a means of stabilising its expenditures. Rudy's suggestion sparked a lively discussion in the media. It reflected the negative reactions of most Belarusians to the proposed amendment. Mothers and babies in particular receive a number of benefits. The one-time family allowance for the birth of a child is about $750, while the average salary is around $340 per month. The state guarantees a maternity allowance (about $70) to every woman, provided she reports her pregnancy before reaching her 12 week term and follows medical advice. Finally, women receive 100 per cent paid maternity leave of 126 days during the final months of pregnancy and following childbirth. New mothers can stay on paid maternity leave for up to three years. In this case, the monthly allowances for the newborn depend on the average salary in the country. Currently, the monthly allowance for the first child equals 35 per cent of the average salary, or slightly over $115. The monthly allowance for each subsequent child lies at 40 per cent, or about $130. According to the UN, maternal mortality rates in Belarus are among the lowest in the world. Mothers can also be confident that they will not lose their jobs after having a baby. However, the family-friendly image of the country is not entirely reflective of reality. Child allowances barely cover basic needs, leaving families with babies in a disadvantaged position. To improve the demographic situation in the country, in 2015 Belarus launched a 5-year family capital program. It supports families raising more than two children, providing them with a one-time cashless allowance of $10,000. By January 2016, the government had approved 11,600 families for this program. It is too early to tell whether this new initiative will be successful. For the government it is a good publicity move. However, it does not provide an immediate solution for people who choose to become parents. The experiences of pregnant women, particularly in provincial Belarusian hospitals, indicate a number of problems, often discouraging women from giving birth. Inadequate facility conditions along with rude and callous personnel turn childbirth into a traumatising ordeal, as in the recent case of Maryna Michnievič from Babrujsk which went viral on social networks in Belarus last month. In 2015 Belarusian president Alexander Lukashenka promised full support to mothers and babies. However, with the October 2015 presidential elections in the past and the economy in recession, the government is now more willing to reconsider the system of social support, including the terms of the maternity leave. Experiences of young families also show that many women return to their work duties sooner in order to keep their families afloat. The monthly child allowance combined with the salary of the partner (provided the woman is not a single mother) is not sufficient to guarantee subsistence. The housing issue adds to the financial struggles of young families: many do not own any real estate and are forced either to live with their relatives or to rent an apartment. Renting expenditure can range from $100 to $400 per month. Finally, those women who use up their full maternity leave allowance face challenges in reintegrating into work life. If they choose to have a second child within this period, they are most likely to lose their professional skills and qualifications, becoming less competitive on the labour market. Unfortunately, Belarus does not promote the option of parents dividing the leave and having fathers taking care of the baby. The legislation also allows close relatives to take leave from work for childcare purposes. Neither the state nor society actually discusses these alternatives. At first sight, reducing maternity leave from three to two years appears to be a rational and timely reform. However, it needs to be accompanied by a corresponding overhaul and expansion of the existing pre-school facilities. Currently the state lacks the necessary infrastructure to organise adequate childcare. Another problem is the underpaid and insufficient staff at daycare facilities, leaving doubts about the quality of these institutions. The news site Tut.by recently published a story of a former daycare worker who highlighted low incomes, hiring of random people, and a lack of professionalism. According to official statistics, the average salary in the education sector in 2015 was only about $200. Finally, Belarusian society is not yet ready to accept that existing maternity leave might become shorter by a year. The prevailing view is that children need to stay with their mothers until they turn three and are more independent and less prone to fall sick, thus not forcing their mothers to take sick-leave. It is evident that maternity leave reform will also require changes in mentality — society will need to free itself from patriarchal stereotypes. Women preferring to remain housewives after their children grow older should stop relying on state benefits. Shorter maternity leave should be accompanied by guarantees of good care in nurseries. Time will tell whether the Belarusian economy will be able to afford this.